Amazing how the answer to our question comes in forms and times when least expected! The other amazing component is that the answer is never what is expected or is it? Let's see, the request for an answer has been spoken or perhaps even prayed upon many times. This could be for direction, guidance, support, love or anything that expands, enriches or enhances our lives. Requests for answers that our heart and mind can conceive and then we patiently wait! Well, let's say we attempt to patiently wait, most of us would like the answer like yesterday! Then unexpectedly an action, conversation, email or event happens that is the answer to the question. However, the answer is unexpected and not delivered in the form that was expected. Then again, what was expected, right? If all the scenario's were lined up and all the anticipated outcomes have been outlined, then why ask the question in the first place! So what happens when the answer arrives and it isn't exactly what you needed or expected or is it? The answer is always what is in our best interest, sometimes a step back is necessary to really understand and fully embrace the message. Answers typically do not come in the form or method that is expected and the timing is never perfect! Time for me now to provide some insights and thoughts expressed in the Double Stixs™ program. Shift perspective and see the answer from a different point of view! Objectivity is our friend! Center your mind, body and spirit! Answer: How was the message communicated? Who communicated the message? Review all that you have written with an open mind. Is there a theme? There certainly is a message that you are meant to receive! The answers may not be a step by step manual but certainly will have a tone or theme. A tone or direction for which to focus, make a plan and take action! A tone that lights a "Spark" that then becomes a plan for which to move life in the direction of the answer that was being requested! Time to take control or perhaps time to go out on your own, explore other options, change a course of direction, are all possibilities from a message delivered. 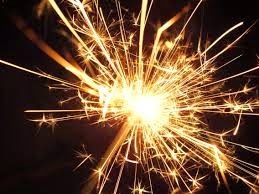 The Spark ignites, a twinkle in the eye returns and the heart says: " I get it"
Time for me now to say: Here's to living each day as "The Best Day Ever"